Gaap is the mighty Prince and Great President of Hell in command of sixty-six legions of demons. According to the Lesser Key of Solomon, the king and prince of the southern region of Hell and Earth. According to the Pseudomonarchia Daemonum (False Monarchy of Demons) the king of western region and as mighty as Beleth. He is said to be better conjured to appear when the Sun is in a southern zodiacal sign. Gaap specifically commands the element of water and reigns over the Water Elementals or the "water demons"
Gaap teaches Philosophy and all liberal sciences, can cause love or hate and make men insensible and invisible, deliver familiars out of the custody of other magicians, teaches how to consecrate those things that belong to the dominion of Amaymon his King (Sometimes not though of as his king therefore and contridiction), gives true answers concerning past, present and future, and can carry and re-carry men and other things quickly from one nation to another at the conjurers will. According to a few authors he can make men ignorant. 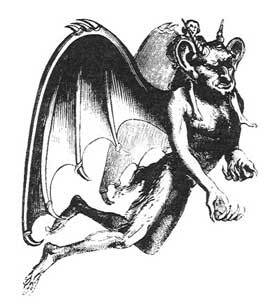 Gaap appears as a man with bat wings. The Gaap fallen angel is a male fallen angel. Back to Demon Names starting with "G"